Ellie Linton: We're not going to hold back. Recording it like this, it's um, it's so important to us. I guess it's our way of telling us that things matter. That we mean something. Maybe... some of the things we've done... The friends that we've lost, hopefully it all makes a difference somehow. Ellie Linton: There's only one way to do this. And that's to go back to where this all began. 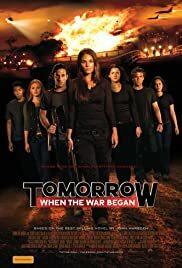 Q: Is "Tomorrow, When the War Began" based on a book? Captivating content and wonderfully ominous mood, but subpar acting. I feel embarrassed to admit that I've never read John Marsden's much loved and critically acclaimed seven-part 'Tomorrow' series, the first novel of which is the source material for this Aussie blockbuster. By all accounts the books are terrific and they have sold between 2 and 3 million copies in Oz alone. However, thanks to my shortcomings as a reader, my cinematic experience was massively enhanced when heading in to see Stuart Beattie's directorial debut as I had absolutely no idea what was going to happen, a major bonus as the story is undoubtedly the strongest element of Tomorrow. Though the trailer hinted at a darker side it emphasised the large-scale components enough to suggest to me this was going to be a run-of-the-mill action flick. 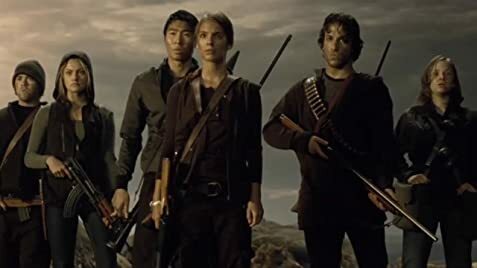 Whilst the explosions and gunfights are decent (especially for a film funded by local resources) it's the slow-building and hugely impactful narrative that drew me in. The plot develops in such a way that it's difficult to be sure what will happen next – the appositely strange mixture of foreboding dread and stirring hope cements this – and the intermittent dramatic twists are injected at the perfect moment. It's not a thriller mind, no clean answers are given and you'll not be indulged with simple pleasures like: what country is the occupying force from? Or why are they here? Tomorrow is more interested in examining the blurred line between right and wrong; the lengths we'll go to in order to protect ourselves and our loved ones. It's not all smooth sailing though, this first instalment certainly has its faults. Lincoln Lewis overdoes the 'true blue' shtick to the point of aggravation, the dialogue is delivered poorly in parts – a scene with the quite obviously beautiful Fiona (Tonkin) expressing how she doesn't think she's good looking is hard to swallow – and a cameo from an experienced Australian thespian is downright awful. 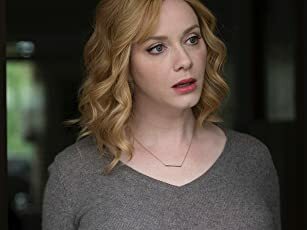 Nascent leading lady Stasey greatly improves upon her "Neighbours" standard of work and, despite seeing her soapie roots coming through every now and then, makes for an easily watchable protagonist. The captivating content and wonderfully ominous mood are slightly undone by subpar acting from the supporting cast, but this remains a recommendable Aussie film.